With Dalston having served as London’s coolest place to live for such a long time, recently overtaken by Peckham, it’s perhaps surprising that such a flagrant tribute to Andy Warhol’s Silver Factory hasn’t seen the light of day – until now. The first East London bar from Tony Conigliaro, often dubbed the ‘Heston Blumenthal of cocktails’, Untitled Bar sits just a stone’s throw from Dalston Junction Overground, on Kingsland Road. Inside, the ground-floor bar is awash with natural light that cascades through the floor-to-ceiling windows and makes the foil-plastered walls shimmer like shooting stars in a moonless sky. The tin-foil is, of course, a strong reference to the Silver Factory – iconic artist Andy Warhol’s New York studio and late ‘60s hangout for the likes of David Bowie, Jean-Michel Basquait, Lou Reed and Keith Haring, famous for the raucous parties held within. Warhol’s original space was festooned with with tin foil, silver paint and fractured mirrors – basic decorating materials preferred amongst early amphetamine users of the 1960s. 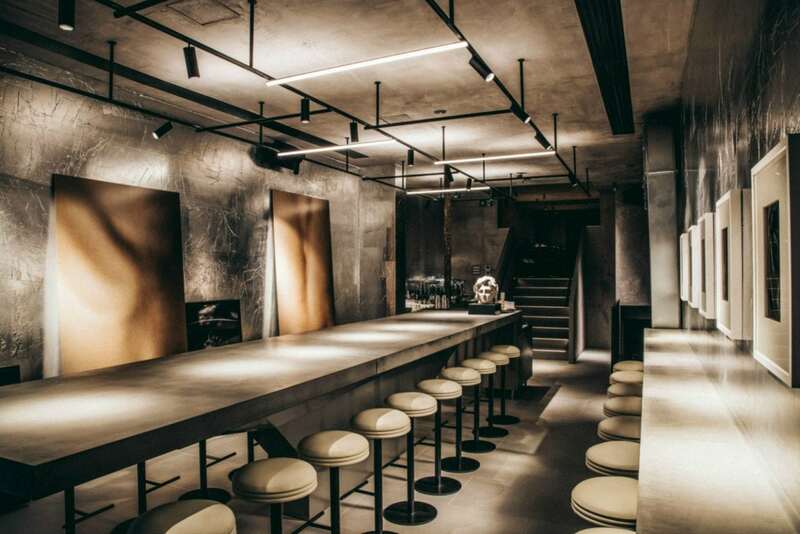 A long concrete counter table with bar stools on each side is a central focus at Untitled, instead of a flashy bar. Arriving on a light Thursday evening, the space soon begins to fill with local, fashionable types (unsurprisingly). Immediately after sitting down, we’re presented with vacuum-packed menus filled with cocktails that have reticent titles such as ‘Snow’, ‘Gonzo’, or ‘Sicily’. All of the cocktails have a rigorously tested molecular approach, each designed by Conigliaro and his team in a working laboratory, just down the road – in Bethnal Green. First, a paper-thin sheet of pink jelly speckled with all sorts of powder cleanses the palate and lends an early insight into the immersive taste journey we’re about to embark upon. Modestly titled ‘Rye’ is served simply in a short, ice-filled glass. The taste, however, is far from simple. A flavour explosion, the drink has a rye whiskey base, accompanied by syrup and bitters (like a classic Old Fashioned, yet without the obligatory orange rind garnish) each infused with rye, carrying the grain’s slightly spiced note, but without ever becoming overwhelming. ‘Amber’, on the other hand, is a fresh, easy-drinking concoction, with orange blossom honey, neroli and vodka, topped with champagne. Another champagne-based cocktail, ‘Waif’ expertly combines intense flavours of tart rhubarb with rose vodka and tea, while ‘Dirty’ is the bar’s unique take on a classic Dirty Martini. Untitled’s spin, no less, teams gin with a forceful vermouth infused with olive leaves, garnished with a succinctly bitter green olive that tastes as though soaked in gin for the past twelve years – a fair after dinner tipple. ‘Violin’, too, is an after dinner drink, served in a specially crafted vessel, designed to resemble the body of a violin. The drink, itself, is irregularly woody and resinous, with prominent aromas of Aramis aftershave. Merely explained as a list of ingredients (“dark oak, pine, beeswax, benzoin, black pepper vodka infusions”) the flavours somehow combine to resemble a rich, well-aged Cognac, instead of vodka. Perhaps best of all, ‘Rice’ features cloudy sake and sake lees, left over from the production, generally used as a pickling agent in cooking. Frightfully, the drink visually resembles the drug-addled milk cocktail (‘Moloko Plus’) described within Anthony Burgess’ A Clockwork Orange. In terms of flavour, the drink is the simplest tasted, yet has a profound clean flavour that’s exceptional with the equally adventurous, Japanese-inspired food served. Miso-soaked tomatoes with yuzu zest, seaweed tempura, and glazed beef short rib with pickled cucumber are amongst the most impressive dishes served. As expected from Tony Conigliaro, Untitled serves exciting, ground-breaking cocktails which, along with the food, combine bold, well-suited flavours. The concept is, by nature, somewhat pretentious – but with warm, friendly service and fun décor, Untitled is a welcome addition to the East-End’s already booming bar scene. Untitled can be found at 538 Kingsland Road, London, E8 4AH.